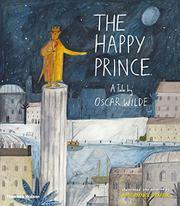 A well-known literary fairy tale about compassion, adapted and with new illustrations. The Swallow’s lyrical speeches have been removed, leaving the basic outline of the story of a gold statue, the titular Happy Prince. As a living ruler, he admits that “I didn’t care what happened to my people.” Now concerned with his citizens, the gold statue asks the kind Swallow (pictured with a white, human face) to stay in the city instead of migrating to Egypt to escape the cold. The Happy Prince wants the Swallow to give his sword’s ruby to a brown-skinned seamstress so she can purchase “food and medicine for her poor son.” He asks the Swallow to carry his sapphire eye to a young, white writer who needs firewood and finally to take his other sapphire eye to a suffering, white match-girl. The Swallow selflessly declares that he cannot leave the blind Prince. Other charitable acts follow as the Swallow gives away the Prince’s gold leaf exterior, but the bird finally dies from the cold and the Mayor orders the now “shabby” statue to be destroyed. As a fit ending for the two true friends, one of God’s angels brings them to a Rousseau-like “garden of Paradise, together.” The bold, expressive, mixed-media illustrations have a childlike look and idiosyncratically include Egyptian palm trees and camels in the northern city. The detailed, busy, often humorous images are best appreciated one-on-one.